Personalized and immediate communication is what users have come to expect, no matter how large your team is. There are plenty of tools out there to help you give your users the immediate information they need and keep them interested in your product. A common tool teams choose is Intercom which sits in your website or product interface. With these tools, users can send direct chat messages to your team. You can also send them little updates via the “chat bubble”. The problem with these is that they tend to go ignored and the messages or your updates disappear. If you announce a new feature or content, there is a good chance users will not see it. There are certain things that it’s better to announce and leave in a findable place. Beamer is an easy to use newsfeed you can install on your website or app that is more central and engaging than just a chat bubble. With Beamer, you can create updates that are visual and engaging by adding screenshots, videos, and GIFs. You can also segment updates so users get a customized notification based on their demographics or past behavior on your site for higher engagement. Beamer really blends into your user interface and doesn’t feel like an external chat. You simply add a “What’s New” tab to your navigation menu with a little red notification indicator. It’s both engaging and visually appealing. It matches your interface exactly and doesn’t look branded by another company. When the Beamer window opens, it does so discreetly on the side of your site’s content. Users can scroll through your updates nicely without leaving the page they were on. Not only does this just overall look nicer than a chat bubble which users have learned to ignore, but it also helps decrease the bounce rate on your site by engaging users in useful content and updates. As mentioned before, users have largely learned to ignore certain notifications. Push notifications, email updates, and even chatbots are now just something else to minimize or forget about. You’re lucky to get a 15-20% open rate on an update email to your users. It’s very difficult to get people continually engaged with your product if this is how you’re communicating with them. Updates in Beamer get ten times more engagement. It’s difficult to get users excited and using new features or exploring changes with a basic chat message. They most likely aren’t reading it. When was the last time you read through a text notification? Beamer updates are more visual. You can add screenshots, videos, and GIFs to engage users and visually explain your updates. Tools like Intercom make your team look bigger and more responsive, but it still requires you’re able to handle the work. You open the door to chat messages 24/7. If you’re not able to respond to them, it can look really bad and users can get frustrated. You will need to dedicate time to this. With Beamer, there is no live chat element so you can set updates live and leave them alone. Beamer allows users to leave comments and reactions like on Facebook that your team can get to on your own time. Users still feel there is a two-way communication but it doesn’t take up your entire day! There are certain things that are better to announce and leave in a findable place. Beamer acts as a rolling, permanent changelog of all your new features, updates, and announcements that users can look back on anytime. Instead of receiving a push notification or an email about a new feature and completely forgetting about it, users will be able to see new and past updates in one central place. This is perfect for new users as well so they can see your most recent updates and see how much your product is improving. Users are more loyal to products that respond to feedback and continually get better. Installing Beamer is incredibly simple. 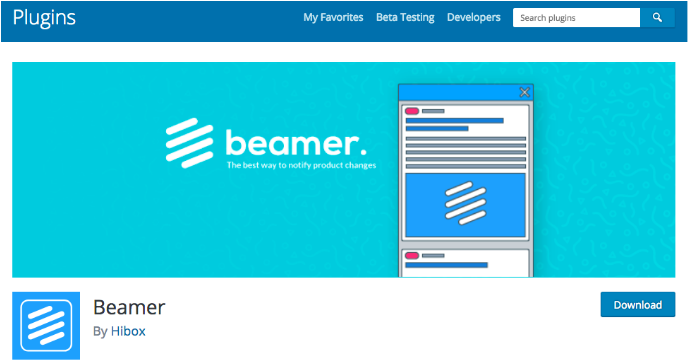 There are no coding skills or tech team required to implement Beamer on your site or app. There are a few ways you can install Beamer. You can copy and paste a script into your wordpress site directly if you’re a little technically savvy. There is also a Beamer WordPress plugin that makes installation even easier with a simple download. Lastly, Beamer is a much cheaper alternative to Intercom. 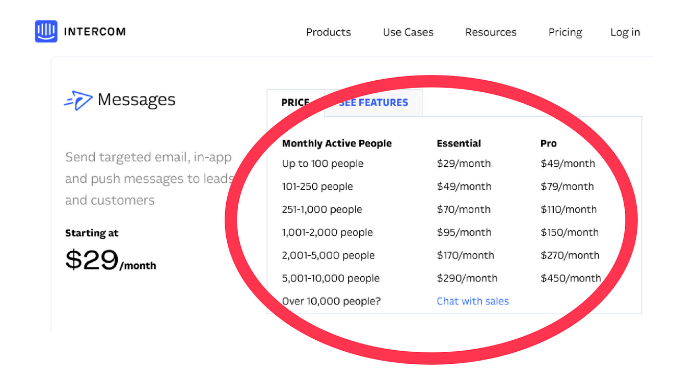 For full functionality of Intercom, you’re normally paying between $213.59 and $563.83 a month varying depending on how many users you have. This can rack up extremely quickly. 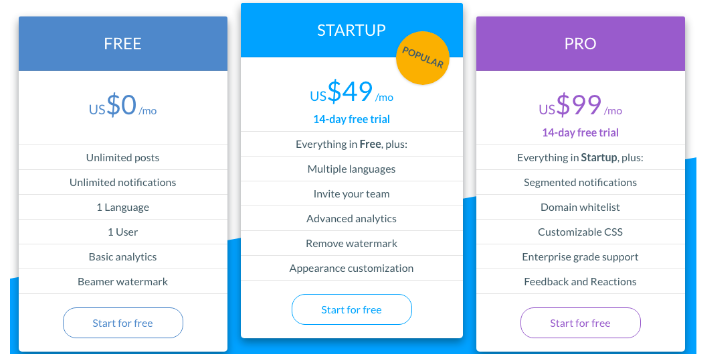 Beamer starts at just $49 a month and it’s a flat rate – no paying extra when you grow your user base. For example, let’s say you’re using Intercom and your site starts with just 250 people. You’re paying $214 a month. Of course you want to grow so let’s say you spike to 2000 people. You’re now paying over $282 a month! With Beamer, no matter how much you grow, the rate remains at $49.